Tom Cummings was an artist and teacher/principal who lived and worked in North Bay, Ontario. Born in Manitoba in 1904, Cummings grew up near Kingston, Ontario before enrolling in the teaching program at North Bay Normal School. After graduation he taught in Eau Claire before moving in 1927 to North Bay, where he worked for many years as a teacher and principal. A lifelong artist, Cummings studied art in Banff and Europe and travelled widely, especially after his retirement from teaching in 1964. 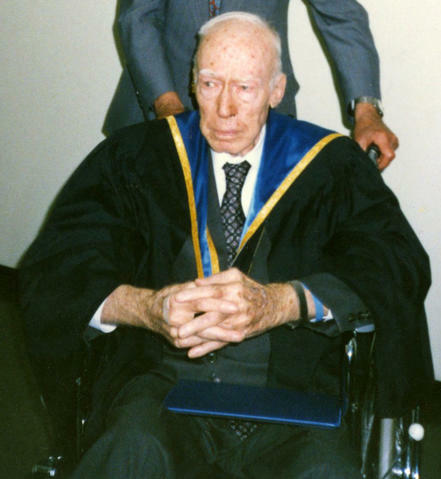 In 1990 he was awarded an honourary doctorate by Nipissing University for his "artistic and humanitarian contribution." He donated a large collection of his artwork to Nipissing University before his death in 1996. The Nipissing University Art Collection contains many pieces of art by Tom Cummings, some of which are stored in the Nipissing University and Canadore College Archives and Special Collections, including 13 sketchbooks and 31 sculptures and molds. Please contact the Archivist for more information.